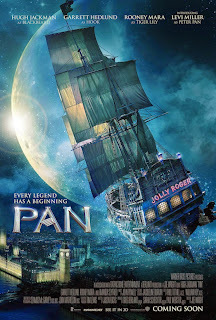 The film stars Oscar® nominee Hugh Jackman (“Les Misérables”) as Blackbeard; Garrett Hedlund (“Inside Llewyn Davis”) as Hook; Oscar® nominee Rooney Mara (“The Girl With the Dragon Tattoo”) as Tiger Lily; Adeel Akhtar (“The Dictator”) as Smee; and newcomer Levi Miller as Peter. Amanda Seyfried (“Les Misérables”) rounds out the cast as Mary, alongside Jack Charles (“Mystery Road”) as The Chief/Tiger Lily’s father; Taejoo Na (“The Kick”) as Kwahu; Nonso Anozie (“Son of God,” “Atonement”) as Bishop; Kathy Burke (“Tinker Tailor Soldier Spy”) as Mother Barnabas; Kurt Egyiawan (“Skyfall”) as Murray; Lewis MacDougall (UK TV’s “In the Name of the Children”) as Nibs; and newcomer Leni Zieglmeier as Wendy Darling. PAN is released in UK cinemas 16 October 2015, with previews on 10th & 11th October.